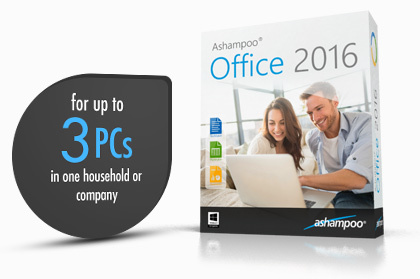 With Ashampoo Office 2016 you can take on any office task. We've all seen Microsoft Office alternatives in the past but never one that is so affordable and fully compatible with Microsoft document formats past and present. 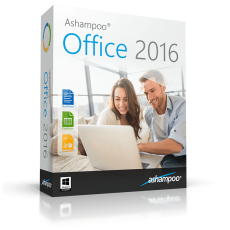 An office suite without compromise, without a lengthy training period, Ashampoo Office 2016 lets you create documents, spreadsheets and presentations faster than ever before. It's the perfect blend of compactness and power. The new Ashampoo Office 2016 comes with word processor, spreadsheet and presentation applications. This fast and compact office suite is fully compatible with all versions of MS Office and convinces with intuitive handling and a vast feature set. From everyday correspondence to scientific work, from greeting cards to sophisticated newsletters: TextMaker 2016 lets you create engaging documents alone or in collaboration with others in no time. Finished documents can not only be printed but also shared as PDFs or ebooks. With over 350 built-in calculations, huge worksheets with support for up to 1 million rows and professional features such as pivot tables, PlanMaker 2016 is ideal for any calculation - be it simple loan comparisons or the entire financial planning of a company. PlanMaker lets you analyze and visualize your data as presentation-grade charts. Presentations 2016 lets you create stunning presentations swiftly. Various customizable template designs take most of the work off your shoulders. Make your slides special with graphics, charts, sounds, videos, animations and transitions and wow your audience with engaging presentations.